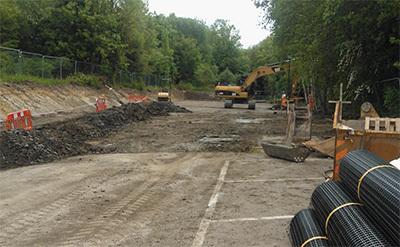 The Gridforce team have worked on a number of successful grid reinforcement installations for Network Rail, from site assessment to full grid installation. Our first project was at Slutchers Lane railway station where Network Rail needed extra parking for their new industrial units situated alongside the railway track in Warrington. Their main concern was the run off of water from the rail line flooding the new car park beneath, and therefore needed s SUDs complaint solution. Prior to the work, the area was an un-used grass land comprising of excess soil mounds and weeds. 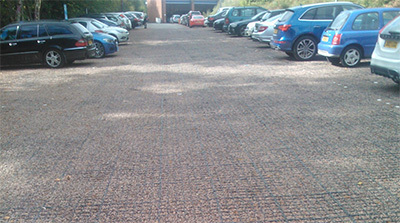 The complete grid reinforcement installation was a success, we were then contracted to complete three other stations (Hanborough, Radley & Cheltenham Spa). These stations were along the Paddington to Worcester line where Network Rail needed to expand on car park space.